Jobu Reviews the Yankees Sweep of the cross-town New York Mets. Yay everyone. It’s time for the Yankees and Mets. My sarcastic “yay” aside, it’s actually good to see the Metsies in town. We covered whether or not interleague play was still fun last season, but it continues and so do we. The Mets and Yankees came into town on separate paths in the last week or so. The Yankees had won two straight series and ten out of the last fourteen games, while the Mets had lost three out of their last four games. Would these trends continue in the first of two series (again) between these two teams in 2012? This one was pretty much a laugher from the beginning, but coming into the game, I wasn’t so sure it would be. The Mets had Johan Santana on the hill on a couple of extra days worth of rest after throwing 134 pitches in his historic no-hitter last Friday. The rustiness showed early, and the Yankees jumped all over him. They then tacked on some insurance late, although it didn’t matter because Kuroda was nearly unhittable. It all came together in a huge win for the Yankees. Opening Salvo! As I said earlier, Santana was coming off of a no-hitter in his last start. In this start, Hiroki Kuroda almost threw one of his own. He held the Mets hitless through 5.2 innings (would have been perfect if not for a Jeter error) before Omar Quintanilla (more on him later in the series) hit a double into the left-center field gap. The no-hitter was gone, and Kuroda got a nice hand from the crowd before finishing up the inning by getting Kirk Nieuwenhuis to ground out to Teixeira at first. Hiroki ended up leaving the game after seven innings with a contusion on his foot (he was hit by a line drive which ricochetted about twenty feet in the air over to A-Rod, who caught it on the fly for the out), but he had done more than his share. Despite being on crutches after the game, X-Rays were negative and he hopes to make his next start on schedule. His final line looked like this: 7 IP, 1 H, 0 R, 1 BB, 7 K, 91 pitches, and he jumped his record to 5-6 and lowered his ERA to 3.46. It’s good to face NL hitters again! The Yankees erased thoughts of back to back no-hitters by Santana pretty quickly in this game. Alex Rodríguez walked to lead off the bottom of the second, and Robinson Canó took a first pitch fastball over the right field fence for a two-run home run. The shot gave the Yankees a two run lead and erased the no-hit and shutout bids for Santana and the Mets. The home run broke a string of eighteen straight shutout innings by Johan (two straight shutouts), but the Yankees weren’t done there. In the bottom of the third, the Yankees got a two-out single from A-Rod. Canó smacked another first pitch, this one a slider away, into the right field seats to give the Yankees a 4-0 lead. What followed sent the stadium into a frenzy, as both Nick Swisher and Andruw Jones homered as well. The back-to-back-to-back home runs were the first for the Yankees since last season, when the same three guys did it too. Pretty cool stat, no? That was it for Johan, and he left the game having allowed six runs on four home runs. The Yankees would add three more runs in the bottom of the seventh on a sacrifice fly by A-Rod, and RBI double by Swisher and an RBI single by Jones to go up 9-0. They would eventually win 9-1, thanks to Ryota Igarashi’s wildness, but don’t worry, he’s now off the team. Big win for the boys from The Bronx. After the game one beat down, I felt pretty good coming into this game. It’s a little scary that I’m starting to have confidence in Hughes, but I’m going to roll with it until he has another stinker like he did against the Angels. Luckily for the Yankees, Hughes was on against the Mets in game two, and a very timely home run by Tex got them another big win against Dillon Gee and the Mets. The word on Phil Hughes is that he gives up too many home runs, which will eventually haunt him in important games. Well, he gave up two homers in this game, and the Yankees still won 4-2, so does it really matter? If he’s not giving up any other hits, and not walking anyone before the home runs, are the home runs that big of a deal? Ideally I’d love Hughes to not give up any dingers (he’s now allowed homers in all twelve of his starts to start the season, which is approaching the Yankees record), but he’s a fly ball pitcher in a small ballpark. Some of those fly balls are bound to go over the fence. In this game, he was touched up for solo home runs by Quintanilla (son of a…) and David Wright, but didn’t allow any other runs in his 6.1 innings of work. I will take two runs in 6.1 innings every time for the rest of the season, I don’t care if he allows forty homers the rest of the way. Boone Logan relieved Hughes with one out in the seventh and was saved by a tremendous running catch by Curtis Granderson on a deep fly ball that would have tied the game if it had fallen in. Cory Wade came in to finish out the seventh and got the first out in the eighth before he was relieved by Clay Rapada, who retired the only two Mets he faced to end the eighth. Rafael Soriano put the tying runs on board in the ninth, but worked his way out of the jam for his ninth save of the year. Everyone stop giggling. That’s what we call home runs at Jobu’s Rum. They Yankees scored four runs in this game, and three of them came on big home runs by their home run hitters. If you listen to the New York media, you can’t win championships if you hit too many home runs. Frankly, I think that’s madness. 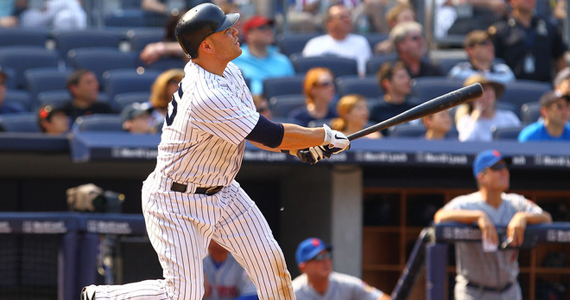 The Yankees struggle with RISP, but it’s not because they hit too many home runs. They should just hit more home runs with RISP. That’s the winning formula, right? Anyway the Yanks got the scoring (and the RISP failures) started early in this one. In the bottom of the first inning Derek Jeter broke an 0-17 skid with a single to center and went to second on a balk by Gee. 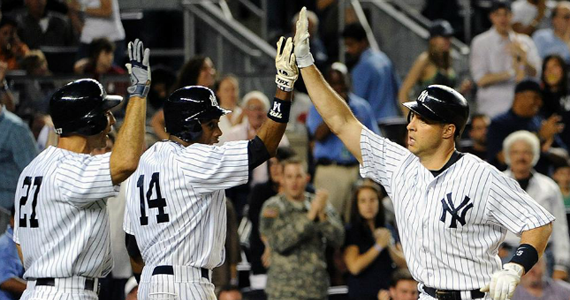 After Granderson lined out, A-Rod singled up the middle to open the scoring, and the Yankees led 1-0. The Yankees then loaded the bases when Canó singled and Teixeira was hit by a pitch, but Raúl Ibañez grounded into a double play to end the threat. He is now 0-9 with the bases loaded, which is right in line with the rest of the team. After the Mets took a 2-1 lead on Wright’s home run in the top of the sixth, the Yankees immediately struck back in the bottom of the frame. Granderson walked to open the inning, and that was followed by immediate outs from A-Rod and Canó. This brought up Mark Teixeira, who worked a 2-2 count before smacking a hanging curve ball over the right field fence for a two-run homer that gave the Yankees a 3-2 lead they would not relinquish. The last run came in the bottom of the eighth on a solo bomb by Granderson, who himself was mired in an 0-18 slump before that. While the Yankees spent the game bungling opportunities, they came through when it really counted the most, and they got the win. The Yankees haven’t had many sweeps this season. In fact, I can only think of two. The first was in the first series against the Orioles back in early April, and the other was a sweep of the A’s in Oakland in late May. They went for the sweep against Jonathon Niese and the Mets on Sunday afternoon and, thanks to some dramatics from Russell Martin, they got it. Here’s how it went down. The Yankees had Andy Pettitte on the mound for this game and, while he wasn’t as good as he was in his last start, he did enough to keep the Yankees in this game until the late inning heroics happened, and that’s really all you can ask on a game-to-game basis. In fact, after the first inning, the Mets didn’t do much of anything at all against Andy. The three runs they scored off of him in the top of the second weren’t even that impressive. Scott Hairston doubled to start the trouble for Pettitte. After striking out Lucas Duda to follow, Pettitte allowed an rbi single up the middle to Vinny Rottino and walked that damn Quintanilla. The bases were then loaded up on an error by Canó, and what followed was pretty much all Joe Girardi’s fault. For some reason, in the top of the second inning down only one run to a team they’d just took two out of three from, Girardi pulled the infield in against the light-hitting Jordany Valdespin. Predictably, Valdespin hit a high chopping grounder that bounced over Teixeira’s head for a two-run double. Had Tex been playing at normal depth, he might get an inning ending double play, but he would definitely have gotten the out at first. There was no need for the defense to get shifty so early in the game, and Pettitte paid the price. After that, Andy pretty much breezed through the rest of his innings. He only gave up singles to Hairston and Wright through the next four innings, and he picked both of those guys off (technically a caught stealing). He came out of the game after the bottom of the sixth, mostly due to his own foolishness in that inning. With one out, Hairston hit a hard grounder that would have probably gone up the middle for a single if Andy hadn’t stopped it. Unfortunately for him, he caught it with his bare hand. I know it’s an instinct play, and that it’s going to happen every time a ball is hit near a pitcher, but I really hate when they do that. Anyway, Andy got through the rest of the inning (despite saying that he couldn’t feel the ball in his hand after the grounder) and X-Rays were negative. He should make his next start. Pettitte’s final line looked like this: 6 Ip, 5 H, 3 R (2 earned), 2 BB, 8 Ks and 95 pitches. He was replaced by Rapada in the seventh, and Wade replaced Rapada in the eighth. After the Yankees took the lead, Soriano came in to close things out, but he failed, allowing back to back doubles to Duda and Ike Davis, which tied the game. After another runner got on, Girardi went to Logan, who got out of the jam with a strike out of Josh Thole and a ground ball to Nieuwenhuis. The Yankees would not take the mound again. 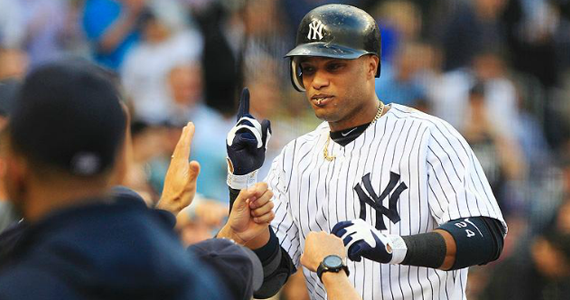 The Yankees offense struggled mightily through the first six innings. They only put five men on base against Niese, and the young lefty was really dealing. In the seventh, that changed a little bit. Canó opened the inning with a single, but was erased on a double play by Swisher. Jones then reached on an error by Wright, which brought up Martin. Russell hit a 1-1 fastball the other way that not only just got over Hairston’s glove in right field, but also hit the top of the wall before bounding into the hands of some doofy guy in the first row for a two-run home run. We suddenly had a game on our hands! In the bottom of the eighth, the Yankees completed the comeback. Bobby Parnell came in to try to hold the Yankees at bay, and he failed miserably. Jeter and Granderson singled to open the inning, and Teixeira hit one just out of the reach of the second baseman to tie the game. The next batter, A-Rod, hit a bloop that, because of the drawn in infield (this was actually the correct move by Mets manager Terry Collins) dropped in for an RBI single. After doing nothing for six innings, the Yankees suddenly had a lead in the eighth. The lead wouldn’t last long, but that was OK, because Martin was set to lead off the bottom of the ninth. The Mets turned to Jon Rauch to get the game into extra innings, and he didn’t even get an out. Martin took Rauch to a full count before getting a pitch to hit. It was a slider that hung over the plate, and Martin hit it over the fence in left for a walk-off homer and the sweep. There was a bit of a scary moment when Martin jumped on home plate. I don’t know if he landed on someone’s foot, or just slipped, but he hit the ground pretty hard. I Immediately thought of Kendrys Morales’ injury in 2010. Morales was injured on a similar play early in that season and didn’t play in a major league game again until this April. Martin appeared to be fine, so hopefully next time he’ll just crawl the last twenty feet to home plate. The home run was the fourth in the last six games, and he has gotten his average up to .216 during his recent hot streak, so maybe he’s finally turning things around.